Packing for a family vacation can be one of the most difficult tasks of an entire trip. Did you remember to pack the diapers and the baby shampoo? How about your child's favorite new toy or book? Having a checklist saves you time and energy. Remove the worry from your vacation planning with these tips and our printable vacation packing lists for your suitcases and day bags. 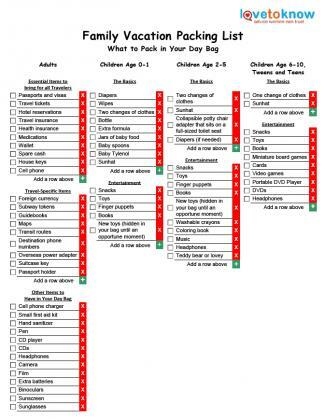 Our printable packing lists cover everything you need for your trip. Each list is customizable to fit your family's needs. Use the green "plus" sign to add items to the lists, or the red "x" symbol to remove items. The checkboxes on the left side of the lists can be used to tick off items as you pack them, or you can print the lists and make your own checkmarks with a pen. Consider printing them a few weeks ahead of time and posting them on your fridge to remind you to buy needed items before your trip. There are two lists available to download. The first describes what to pack in your day bag, an essential travel item for any savvy parent. The second tells you what to pack in your suitcases. 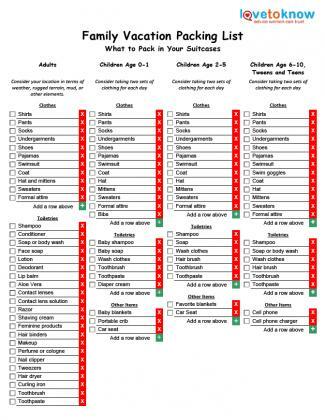 Both lists are organized by age range. Your day bag can be used throughout your entire trip. When your family needs something, you will have it right at your fingertips. Even if your kids have outgrown diaper bags, a day bag for parents is still a good idea. You can use a large purse, a backpack, or even a small roller bag. If you are traveling by plane, assemble soft food or any liquids near the top of your bag so that you can quickly take them out before you walk through security if you are flying. Make sure to use clear plastics bags for these types of items to be in compliance with airport security requirements. If you need help downloading the printable packing list, check out these helpful tips. Most airlines charge bag fees now, but on a family trip there isn't much way around packing several full, well-stocked suitcases. Plan to check bags as part of the price of your trip. There are many ways to cut down on how many things you need to bring, such as packing your suitcase in a more compact manner using special vacuum-sealed storage bags. Another trick is to find a department store near your destination and plan to buy bulky items like diapers once you arrive. Just remember to bring enough diapers and baby food for unplanned events like long layovers. Make sure to weigh your bags at home and ensure they are lighter than your airline's weight requirement and to minimize checked bag fees. Does your child really need to bring their life-sized doll, or would he or she be satisfied with a favorite bedtime lovey instead? Consider how many things you'll be able to carry, including your child. Use a backpack if you have one so that your hands can be free. If you have a very young child, invest in a baby carrier to strap to your body. Your older children can carry small things in their own backpacks, but consider that they may tire of this and you could find yourself carrying that as well. If you're traveling by car or train, consider when and how you will carry bags between places. You know your children best. Bring items that will keep them happy and healthy throughout your trip. Try buying a few new toys and hiding them in your bag. When the going gets rough, you'll be able to use these to surprise your child. In a pinch, anything in your environment can act as a distraction--the window on the airplane, napkins folded into shapes, or even their own shoes. Some children can play peek-a-boo for hours. Others like songs or toys. Try bringing a small photo album of family or friends to keep your kids engaged. Avoid stickers as you may find your little one pasting them places they don't belong. Planning a vacation can seem overwhelming at times, but if you plan in advance and use a packing list, you will have everything you need for a successful trip. Rest easy in the knowledge that most destinations have department stores. Remember that hotel concierges and travel employees are there to help you, so utilize their services as needed. Take a deep breath, remember to print our packing list, and enjoy your trip.